Welcome to Blooms Heating and Cooling! 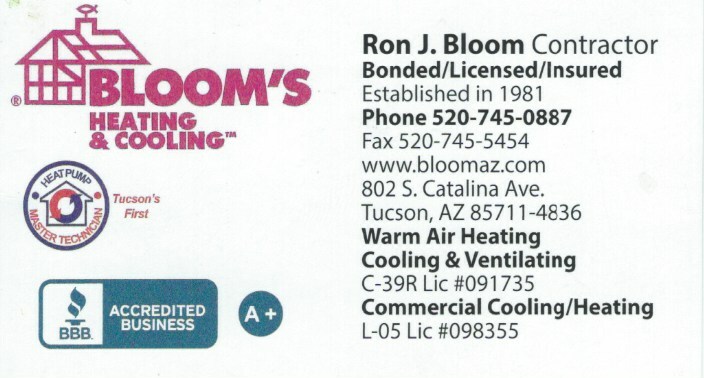 Bloom's Heating and Cooling has been serving Tucson and southern Arizona since 1981. At Bloom's Heating & Cooling we provide quality, reliable sales, service and support for all your heating and air conditioning needs.. Founded in 1981, Bloom's Heating & Cooling offer's quality heating and cooling products from all manufacturer's. At Bloom's Heating & Cooling our highly trained staff can service all brands of heat pumps, A/C systems and furnaces. If reliable sales and service is important to you then Bloom's Heating & Cooling in Tucson, Arizona is your specialist to call at 520-745-0887. To learn more about Bloom's Heating & Cooling please visit our links to the left. People you can count on and the customer comes first!